Looking for a new dish to add to your Christmas feast? How about something time-tested? The recipe we’re about to share is definitely that (a hundred years, at least), but you can be sure nothing about it has gone out of style. It’s an oldie, but the Close To My Heart employee who shared it guarantees that her great grandmother’s recipe has yet to disappoint. Cooks young and old, we bring to you Grandma’s Old-Fashioned Dry Dressing! Savory and crumbly in the most delicious way, this dish will have everyone coming back for more. Good thing it’s so easy to make! 1. Two days before your feast, spread out slices of 1 loaf white bread on baking sheets to dry in the open air. 2. When you’re ready to prepare your meal, break bread slices into bite-sized pieces. (They don’t have to be completely dry to still be delicious!) Place them in a 3-quart baking dish. 3. Chop an onion into bite-sized pieces and mix in with bread. 4. Sprinkle rubbed sage into mixture to taste. 5. Melt a cube of butter and drizzle over mixture. (It’s up to you how much butter you use, but keep in mind that the butter will help cook your onions and lends a lot of flavor to your dressing.) 6. Cover dish and bake at 350° for approximately 45 minutes to thoroughly cook your onions and to produce a steaming final product. If you prefer crunchy onions, remove dish from oven sooner. *Note: Shallower dishes will require less baking time. 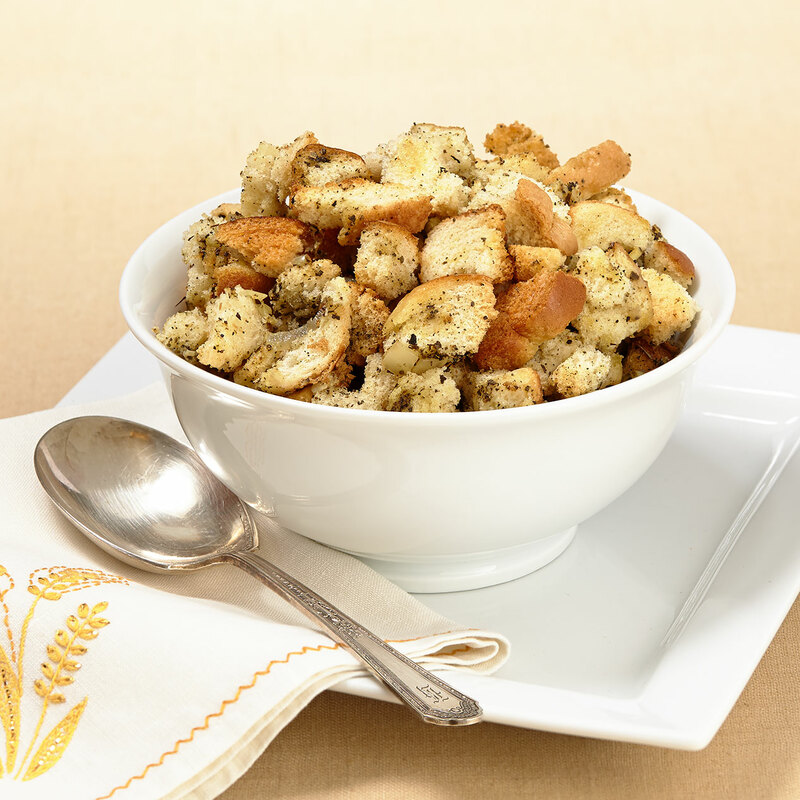 If you have extra stuffing mixture that won’t fit in your baking dish, store it in the fridge and bake it to eat with your other leftovers the next day. There aren’t usually leftovers of this dish once the feast is over, so you’ll be glad to have such a treat. We hope you enjoy this old-fashioned addition to your feast. Happy Holidays! Thank you for sharing this recipe! Love to try new recipes and this one will be on my list! Thank you!!! My great aunt introduced this recipe to our family. (She added pecans.) We are from Oklahoma. My sisters and I have been looking for a similar recipe for years! Our mom made it every year and now we do for our families!! Thanksgiving blessing! !